Jin Hi Kim, Korean-American composer and electric komungo player. Steel pan player and composer Andy Akiho. The selection below is from Bradley Fish, an Israeli/American guitarist who is here improvising on a Chinese guzheng. This is Turkish theremin player Cihan Gulbudak, performing under the name Meczûp. You can also find him on Facebook and MySpace. Here is a Danish guitarist influenced by Keith Rowe (shown in part 1). His name is Johan and his YouTube moniker is ThumbsAtWork. The Monmouth Civic Chorus performs its Messiah and Christmas Oratorio program 4 p.m. today at the Count Basie Theatre. Visit the group's website for more information. The Arcadian Chorale also performs at 4 p.m. today at Holy Spirit Roman Catholic Church, 705 Second Ave., Asbury Park. The group is performing holiday favorites, including some in Spanish. For more information visit the group's website or call 732-775-0030. There are a whole bunch of videos out there in YouTube-land that I have fallen for in recent months. Some of them are professionally staged performances, some are living room performances. At least one is an audition tape. All of them are apparently single-take live recordings (even where the video is clearly edited, the audio appears to be a single performance). Most of those I'm interested in are experimental music--but not all. The players are spread around the globe. If one thing unites them, in my mind at least, it is the need to reach an audience with a simple live performance. This seems a little ironic, given that the video is recorded and posted online. But that disconnect only serves to underline the effort they are making to reach an audience. And that's where we come in. The material generally is raw musical sound--not studio manufactured--and the intention is open and pure. We delight in the music as the musician delights in the music. I'll present these in a series of posts over the coming weeks. First up is a find I shared with Facebook friends about a month ago, featuring Keith Rowe, pioneer of prepared guitar. For those interested in learning more about Rowe's music, there's a wonderful video available with him talking about his music as a voiceover, with video of him performing. Here's the video of the recent Springsteen and E-Street Band performance in the Asbury Park Carousel Building. I mentioned in an earlier post that my grade-school-aged son more or less accidentally was among those in attendance, albeit outside in the cold. The video was made available online starting this morning, as a promotion for the newly released box set compilation, The Promise. If the video below doesn't display properly, click on the title displayed on the video and it will take you to the full screen view on www.vevo.com. Note: I've added ticket information at the end of this post. The Monmouth Civic Chorus presents its annual Messiah, with orchestra, 4 p.m. this Sunday, Dec. 19, at the Count Basie Theatre in Red Bank. The group presents the traditional Christmas portion (Part 1) plus the "Hallelujah" chorus. They'll also perform selections from Bach's Christmas Oratorio. Featured this performance in a column in the Asbury Park Press recently. Soloists are Elisa Singer and Silvie Jensen, sopranos, David Kellett, tenor, and Andrew Cummings, baritone. Conductor is MCC director Mark Shapiro. The MCC is one of my favorite groups in the area, and I've said so in the Asbury Park Press many times--ambitious, creative, well-rehearsed, highly organized. Artistically, Shapiro is first rate and the group's administrative machine seems a model for other regional ensembles. I haven't agreed with every choice the group has made, but on the whole, it obviously offers a positive experience for its members and some terrific performances for audiences. Tickets are $45 and $25 with discounts for seniors, groups and students. Tickets are available at the group's website, www.monmouthcivicchorus.org, or by calling 732-933-9333. The audience is encouraged to bring nonperishable foods to donate to Lunch Break. Christ Church Choir and the New Brunswick Chamber Orchestra will present two programs at the church in the next two weeks. The first is the "Holiday Choral Concert," 7 p.m. Sunday Dec. 12, featuring the Christmas portion of Handel's Messiah, Gloria of Vivaldi, and "Nun komm, der Heiden Heiland" (BWV 61) of J.S. Bach. Soloists are Diana and Cathryn Whitener, sopranos, Giulia Utz, contralto, William Ambert, tenor and Frederick Fischer, baritone. John Sheridan conducts. Tickets are $18, $15 for students and seniors available at the Parish office or at the door. The second, "Lessons & Carols," will be a free concert of traditional and contemporary music and carols, 4 p.m. Sunday, Dec. 19, conducted by Sheridan and Renata Koumendouros. On the program of shorter works will be music of Brahms, Renaissance masters Orlando di Lasso, Orlando Gibbons and Palestrina, 20th Century genius Benjamin Britten, and many others. Christ Church is located at 5 Paterson St., New Brunswick. For more information call 732-545-6262. Hitchhiking home to Trenton from the middle of Ohio, I couldn't get a ride. Eventually had to give up and take a bus from Steubenville to Pittsburgh and a train from there. Plus, I had to change trains in Philadelphia, where I got to the old Reading Terminal somewhere around 2 or 3 a.m. on Dec. 9, 1980. So at this moment, 30 years ago, I am on an empty train, taking it's sweet time crossing the black farmland along the Pennsylvania Turnpike. I am 22. Full of wonder at the world, writing songs as steadily as breathing (most of them bad, but I was making progress), irresponsible and uncaring about the present, uncertain about my future, terrified and thrilled at the impossible twists and turns my life would take. The hitchhiking and waiting for the bus and the train and the rides themselves, all of it had taken something like three days. Maybe longer. A long, long time for such a short trip. One scene I remember is standing by an exit ramp, my thumb out, where I'd been for many hours, when I flock of white birds landed all around me like a surreal snowfall. I walked out of the birds and soon after got a ride a short distance. Then more waiting. The oddest part was, I had dreamed about the birds a few nights before, lying in a dorm bed on Antioch campus, where I was visiting. Both in the dream and in reality, they were a beautiful spectacle. But the rides were few and didn't last long. And after all the weirdness and delay, after finally giving up and taking the bus to the train, I found myself, days later, in Philadelphia. Reading Terminal was a cool, gigantic cave, with these focused breezes filled with dusty smells that would blow, wrapping around your legs and making your clothes and your hair smell of metal millwork, concrete dust, pale engine exhaust. It was one of those old-fashioned railroad stations like I imagine might still exist somewhere in Europe. Great iron beams arching over the tracks and platforms, the ceiling laced with dim, filthy glass, wooden benches in wide rows in the interior waiting and ticketing area, a dozen concessions all shut tight. It's not like that now. Now it's a shopping mall, linked by walkways to another station a few blocks away and filled with lights and noise. The modern ambience is as connected to the machinery of the trains as a penthouse is to the services in the basement. But in 1980, the station and the trains were still one. Imagining the industrial age as a living being, these giant buildings were like lungs. And I was standing inside one of those, the organ of a massive, busy monster, as it slept, feeling its breath curl around me. Waiting there, it was hard to get comfortable and impossible to sleep. But I was waiting for the next train to Trenton, had already bought my ticket back in Pittsburgh, in fact. I had no choice but to wait. I overheard a young black man telling the woman he was with, shaking his head, "I couldn't believe that was who they were talking about when I heard it, you know? It didn't make any sense." That was all I heard. I waited. Another hour, maybe two. Now it's about 5:30 a.m. and I give up on the song I'm trying to write in my head and the daydream surrounding it that had for a couple hours held out some hope of escape from the grind of the station. I look around and get up and start to walk and I pass a man with a newspaper up in front of his face and the headline says, "Lennon Assassinated" or something to that effect. I think it was the Daily News. I remember for a fraction of a second thinking it couldn't possibly be John Lennon--assassinations happened to political figures and John was a pop star. But then I immediately put that headline together with the scrap of conversation I had overheard and realized that, if it was true, then I was having the same reaction as that young black man. I, too, simply couldn't get my mind around the information. And I realized, before I knew for sure, and partly because it was so incredible, that it probably was true. It probably was John Lennon. I had already bought the new John and Yoko album, Double Fantasy, and had owned all the Beatles' albums at one point and of course each of the Beatles in turn had been a boyhood fascination. But as an adult, only Lennon had remained a hero--for his intelligence, his wit, his artistry, his characteristic struggle to use his public image to overhaul public sentiment on a variety of issues. His songs were the best Beatles songs, I was convinced. And his voice, among the many pop stars who spoke on public issues, was singular in its ability to make compassionate, critical sense of the world and to demand more from it. I liked the other Beatles, but Lennon stood apart--from everyone. So there I am on Dec. 9, 1980. I had walked over to the guy with the paper, asked him where he bought it. I thought all the concessions were still closed. No, he told me and pointed around the corner. I went and bought my own paper and read as much as I could of the account. Asleep, traveling, bored for all of Dec. 8, alone and far from a radio or TV, I had missed it completely. And now, in the train station, my train is boarding. I am 22. Lonely. Exhausted. Stunned. The sun is coming up over the tracks, shining in line with the trains straight down the tracks, straight onto the concrete platform, red and gold and glorious. See my note of corrections at the end of this story. I helped teach a class on Springsteen's lyrics as literature earlier this semester. A great experience, but I only mention it here as background for another story. I've known about Springsteen since I was in high school in Pittsburgh. Have studied his songs. Thought about his work. My son came home from school today, idly talking about his day. Bunch of kids absent. No homework because they had extra time in class to do it. Blah-blah-blah. Oh yeah, and they watched Bruce Springsteen today. "What was he singing?" I said, curious. What video would his teachers be showing a group of elementary kids? "Christmas songs," he said. "Can I play a game on your phone?" My daughter, sitting in the room, piped up. "Yeh, I heard Springsteen was at the Carousel building today." "Oh, really?" I said, curious. "I hadn't heard about that." "But that's what I just said!" my son yelled, irritated that clearly we hadn't been listening. Silence. My daughter and I looked at each other. Two plus two were beginning to add up. "Um," I said. "You saw Bruce Springsteen--live--performing--at the Carousel building?" "You saw Clarence Clemons?!" I asked my son. Blank stare. "Was there a big, black guy, playing saxophone?" Mind you, one gaping hole in my Springsteen knowledge is I have never seen him live. Never. Ever. I've seen him in person, but not performing. It goes without saying, I've never seen the E-Street Band. To my son, all this is just funny. Not even funny, just a cool distraction from the school day. An interesting, unplanned field trip. Otherwise, no big deal. Some old guy playing Christmas songs. Let's get on with the video games. NOTE: Spoke with the teacher this morning and it turns out we got some big details wrong. First, my son's class didn't actually get inside the Carousel building. They were among the 150 people standing in the cold outside. Second, he didn't actually see the band, as anything more than shadowy figures behind the glass and plastic sheeting. He thinks Clemons was there but he wasn't sure. Third, the band wasn't playing "Christmas songs." They were playing classic Bruce tunes, mostly from the newly released box set, The Promise. His teacher had said specifically that the class could tell people they "heard" Bruce Springsteen play live. It was so cold standing there that they stayed for only a few songs, so when Springsteen came out to shake hands with a few people, they had already left. Apparently, Bruce did play some Christmas songs after all. And Clarence Clemons was there. My son's report turns out to be more accurate than I was giving him credit for. For tonight's performance of Pierre Boulez's music by the Talea ensemble at Miller Theater, the theater provided a short video, below, including some tantalizing excerpts of Derive I and the new (2006) Derive II. The video is provided as a promo and I guess it worked: tickets for the Miller's 600-plus seats are sold out. Pierre Boulez Composer Portrait Preview from Miller Theatre on Vimeo. My experience with Boulez began as an undergraduate at Trenton State College, introduced to his music by my composition professor, Laurence Taylor, who was a friend of Boulez's. While some of the early revolutionary scores like Le Marteau sans maitre and Structures for two pianos mystified me, I fell in love with Pli selon pli and Le Soliel des eaux, both of which highlight voices, and, later, Rituel, a more impressionistic work evoking monastic ceremony. I attended the New York premiere of the massive "Repons", a landmark score for its use of interactive computer transformations among other things. Through reading about him I discovered the music of Berio, Ligeti, Xenakis and others, composers that still serve as inspirations for experimentation and models for what is possible. Someday, when I sort it all out, I'll be able to talk about the ways in which my exposure to Boulez's music in particular has shaped my own. I recall studying his treatise on his compositional technique, "On Music Today" while I was writing my first works in extended forms. Definitely there were some practical ideas that incorporated. But it's more than that. While my music is vastly different, far simpler, I am deeply moved by this stuff. Listening to a Boulez score is like watching patterns in cloud formations, or patterns on the surface of a lake--ephemeral, chaotic, astoundingly beautiful. Below is a video clip of the first performance last year of a new instrument. dubbed a "fluid piano" by its inventor, British composer Geoff Smith. The piece is Fluid C composed and performed by Matthew Bourne. Many pianists and composers have lamented the fact that a piano can't be retuned easily. Equal temperament is the default and most instruments are just stuck with it. Electronic keyboards offered some alternatives, but they are ... um ... electronic. They don't have the life and the soul of a fine acoustic instrument. Over the centuries since keyboard instruments rose to prominence, others have tried their hand at modifying the design so that it could play microtonal music or variable tunings. By far this strikes me as the simplest and most practical effort to date. It has the further advantage of being entirely mechanical--no electricity needed at all to make the thing work. The design could play standard piano music or any number of alterations. Part of its charm, but also it's greatest limitation, is that it uses a standard piano keyboard. That means that should you want a scale of, say, 21 notes in an octave, and you're going to be using more than 12 of those at any one time, then it's not going to be playable on this instrument. On the other hand, a little bit of creative planning on the part of composers and performers could overcome that limitation (retuning with one hand while playing with the other, for instance, as the performer does here). The instrument shown here has a thinner, harpsichord-y timbre. That is entirely charming in its own right, but I imagine it has more to do with the instrument's prototype status than any limitation in the design. In short, I'm really excited about the prospects for the fluid piano. I would love to try one myself. I anticipate many composers of many nationalities taking advantage of this instrument's flexibility to create a whole new genre of keyboard and ensemble music. Classical Sundays at the Puffin this week features the Israeli Chamber Project, a new group that features various combinations from a young collection of performers in traditional and contemporary work. Below is a video of the group performing a commissioned work, Night Horses, by young Israel-born composer Matan Porat. The group for Sunday's performance will be Itamar Zorman, violin, Assaff Weisman, piano, and Sivan Magen, harp. The exact program is unavailable at the moment. The place is 20 Puffin Way, Teaneck, NJ 07666. The concert is 4 p.m. Suggested donation at the door is $10. Reservations are recommended. Call 201-836-2499 for more information, or visit The Puffin Foundation website, http://www.puffinfoundation.org. Matan Porat: Night Horses from Israeli Chamber Project on Vimeo. This article highlights some interesting aspects of the social and political challenges every orchestra conductor faces. We don't know the whole story--and probably never will. What we can say for certain is that she shouldn't have walked out. But it appears she may have been in some ways justified. And given the remark (by the former conductor of the ensemble) that some members were resisting her leadership because of her gender, we can probably assume there was significant unprofessional insult aimed at her beforehand. It's important to remember that the success of an orchestra requires a very delicate balancing act on the part of the conductor--a firm, gentle hand and a supreme confidence--as well as the complete musical skills set. As with captaining a ship, poor leadership on the part of the conductor or strong resistance from the members of the orchestra can easily sink the whole enterprise. Sounds here like the players allowed themselves to head down a dangerous path of not trusting their leader--until, finally, as a direct result of that conflict, the ship ran aground. I was MIA in this blog for most of October as a result of a convergence of personal and professional demands. Most lovely among these was substituting as instructor for two weeks in a freshman seminar at The College of New Jersey. I already am teaching one freshman seminar class (on the topic of "Music and the Natural World"). Here though, I was asked to fill in for two sections of the course, "The Lyrics of Bruce Springsteen as Literature." I live in Asbury Park and have followed Springsteen's progress since "Born to Run" hit the charts while I was in high school, so this assignment was a natural fit. Freshman seminars are designed to introduce students to the work involved in real scholarship at more advanced levels. Ideally, they would pick something that interests them and be guided through detailed study, modeling the experience of upper-level undergraduate or graduate school courses. The reality falls somewhat short of that: The students are forced to choose from a list of predetermined courses and asked to balance their course selections across from categories designed to cover the whole of the liberal arts. Then they have to shoehorn those choices into a daily schedule. As a result, every class will have some kids left wondering why they are there. But still, the goal of the program is to engage the freshman in individualized research--very different from my first years in college. Considering Springsteen's lyrics as literature isn't a stretch. We've seen presidents, politicians, authors and commentators quoting from his songs. Albums recorded in the 1970s and '80s still have currency, finding new audiences and influencing young musicians. Subjecting those lyrics to a semester-long course of study might seem over the top--until you actually start the research. Then it becomes clear there's a lot to say. So much has been written about Springsteen's music--thousands of books and articles--but much more could be. In the classes I taught, for instance, we spent a good bit of time on the political ramifications of the song "Born in the U.S.A." (1984) and how the deliberately patriotic album cover and the upbeat, anthem-like music seemed to contradict the lyrics' portrait of a beat-down vet. That contrast alone is worth a ream of paper at least (especially since Springsteen recorded an earlier, much more subdued version of the song). We noted the way the words succinctly capture complex social issues surrounding the Vietnam war, ("I had a brother at Khe Sahn, fighting off the Viet Cong/They're still there; he's all gone"). 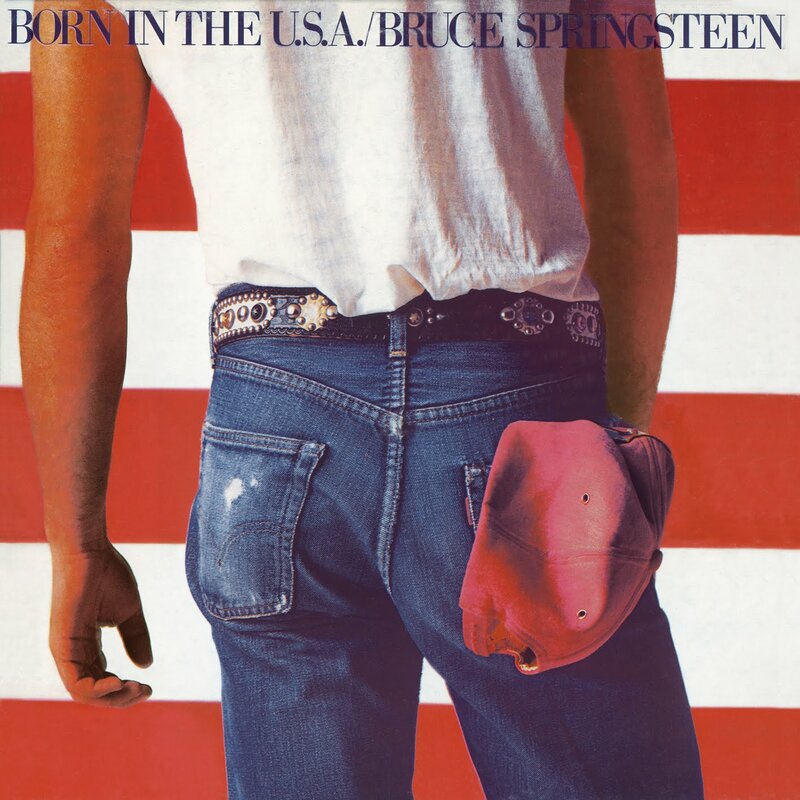 The narrator is not Springsteen himself, but one of the many working class joes that populate his songs. That character is celebrating his rough birthright with all the joyous fervor of a good barroom brawl. He challenges us to accept that this is his America, too. Is it OK to celebrate failure? Is it patriotism to write about things as they are? Great questions for freshmen to try to answer. Every album since the 1975 "Born to Run" is full of similar, if less obvious, conflicts--challenges to societal norms, provocative blends of good and evil within a single character, jabs at political issues, difficult personal relationships worked out through characters and rhymes. You don't have to be a die-hard fan to mine the rewards of these stories. But for me the best part of teaching these classes was not Bruce. It was, as always, simply being able to talk to the freshmen, to participate in the flow of ideas and insights that are shaping who they will become. Open faced and newly vulnerable to the robo-assembly line challenges slamming them every second, they give me a reason to believe in a future less horrorshow; a hope that somehow together, taking a careful look at meanings--almost regardless of where we find them--we can help put humanity to rights. My friend Stanley Alexandrowicz will be playing a guitar recital 8 p.m. Saturday Nov. 13 at the Paul Robeson Center for the Arts, 102 Witherspoon St., Princeton. The program consists of half 19th Century music and half more recent works. 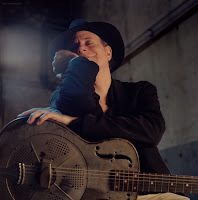 One of the first things that interested me about Stanley when I met him over 20 years ago was his rigorous scholarship, a seemingly fathomless curiosity and knowledge of guitar repertoire and classical music history in general. Performing with him--either in historical or newly written music, sometimes even my own--is always a thrill. By the mid 1830's MOST of the virtuoso guitar composers were adding a string or two for enhanced harmonic/sonic possibilities. … By the END of the Romantic period, nearly ALL of the great virtuoso guitar composers had found that ten strings would serve their needs. … As I explored the 19th C. repertoire, I realized that MANY of these pieces just don't "sound right" on the modern guitar. For example, one piece I found ONLY needed a low D as part of its structure—but if I tuned the sixth string [normally tuned to E] TO low D, the fingerings to get the low E were impossible! So with ten one can have all the options. Stanley goes on to talk about how this style, used by guitar builders of the "Viennese/Russian" school, was overshadowed by the popularity of the Spanish style guitar, largely due to the influence of world-acclaimed virtuoso Andres Segovia. Even the SIZE of the guitar fingerboard was influenced—Segovia had big, FAT fingers, so a wide … fingerboard became standard. But with the rise of interest in historical accuracy, guitarists are rethinking the reliance on the 6-string model and finding that some of the 19th Century compositions really require the extra low strings. He also implies that the interior construction, and thus the sound of the instrument generally, is better than the Spanish model. Composers on Stanley's Nov. 13 program include Ivan Padovec, Napoleon Coste, Witold Lutaslowski, Vaclav Kucera and Manuel Ponce. For more information call 609-924-8777 or visit The Arts Council of Princeton website. Writing about the 40th anniversary of Jimi Hendrix's death for the Asbury Park Press this morning. That article will appear as my Music Notes column in Sunday's Entertainment section. Meantime, I stumbled on an interesting article that outlines the conspiracy theory around Hendrix's death. The author concludes that, whatever the exact circumstances, it was the system of capitalist marketing and greed that killed Hendrix. For those who missed the news last week, a BBC article on the house in London where Hendrix once lived next door to the Handel House Museum. The museum currently has a Hendrix exhibit up in his old apartment. The BBC article includes a short video, with some clips of Hendrix in action. Also, you can read my blog entries on Hendrix's "Star-Spangled Banner", written last July. Last week's Music Notes column in the Aug. 29, 2010 Asbury Park Press on Sacred Harp singing mentioned that the "singing schools" style went out of fashion in the Northeast in the beginning of the 19th Century, but was preserved in the South and Southwest. 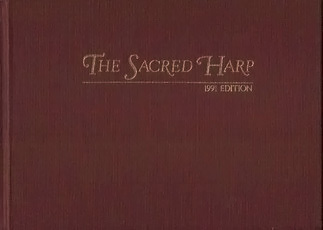 The songbook The Sacred Harp from which the style takes its name, was published in Georgia in 1844 and has never gone out of print. A couple more things need to be added to that history to give a more reasonably complete picture. First, the style died out in the North because it was considered vulgar. Had the more educated elite in the South had their way, it would have died out there too. The taste of the time presumed that culture of any real value had to come from Europe. Anything made here was cheap imitation. As the economies in northern cities took off, those place shunned the second-fiddle, homemade culture in favor of the imported variety. Shape-note was built on European traditions, but it was nothing like them. It was rowdy, democratic and required no education--not even an initiation or a profession of faith--to participate. You showed up, you were in. You learned the songs by singing them. The areas that embraced this music and never let go were, at first, the wilder parts of the U.S., populated by working men and women who necessarily put less emphasis on education and refinement--Kentucky, Ohio, Tennessee, Missouri, Georgia, Alabama, Mississippi and Texas. Undoubtedly many of the folks in those parts envied the rich and would have followed them if they could. But as a rule, they were not rich. And to a very real extent, their lives literally depended on their ability to revere far simpler pleasures. Here I could stretch the point to emphasize the empowerment provided by shape-note singing, the vitality of a congregation that needed no leader and the fear that such unmarshalled power could have aroused in the leaders of America's frail religious, economic and political societies. Probably there is some truth in that. But maybe we don't need to go there. Maybe it's enough to say that this music, powerful for unlearned, represented the image of the dumb, backwoods hick that the socially elevated and "cultivated" Americans were hoping to banish. As a side note, this history can't help but remind me of the current suspicions--by Tea Party-ists and others--about the secret society of "elitists" of New York and the Northeast forcing the rest of the country to live according to its standard. While it may be empty rhetoric now, that bad blood goes way back and has some basis in truth. It seems only slightly ironic that the North's great centers of education--New York, Princeton, Boston, Philadelphia--now embrace shape-note singing as a living American tradition. But with great centers of wealth and learning now located in the South and the West and the tracks of commuting paths blackening the continent's vast distances, all such purely geographical distinctions have to be taken as trivial. And so to the second point: shape-note is a living tradition. Each generation since that of the first New England composers has added to the body of music that congregations perform. While the style is tightly constrained, it is not simply a recreation of the past--not a "living history" of the usual type, not merely a reenactment. The music is ever-changing. Each performance is really alive in the here and now--to which composers respond with even more here and more now. I would love to see this tradition spread to every community--to hear the sweat and toil, the aggravations and indignities of common life expressed in full-voiced song challenging all the powers that be, to have political anthems and moral arguments composed and sung by opposing congregations in boiling shape-note battles. To have politicians answer the congregations in call and response. And if the candidate can't sing--bring on the hook. A painter doesn't necessarily begin at the left edge; a writer doesn't necessarily write chapter one first. They rely on an overall design, a plan or an outline that only they know. Typically, nothing is set in stone during the creative process. Once the material is more or less complete--or at any point for that matter--the artist can go back and rework the entire form or touch up the details. Music is the same way. It can be composed in a freewheeling straight line, beginning to end. Or it can be designed from outside of time, as it were, to fit a predetermined shape. Either one can appear improvisatory. And either one can appear to be self-referential, assuming the composer has a memory and can plan on the fly. Writing serious classical music, I often set up an abstract form in advance, based on a certain quality of material--an interval set, a polyrhythm, a numerical series that influences several domains simultaneously. My drum set solo that Peter Jarvis premiered spring of '09, Jungle 5-7675 works this way. At other times I'll choose a simpler form that can be more easily elaborated and tweaked as I move through the composition process, as, for example, in the prelude Certain Dark Things that I orchestrated for the Monmouth Symphony Orchestra last fall. When working in pop song styles, the same thing happens, even if the designs are more rudimentary. Each pop song represents a preexisting form chosen from a fairly limited universe. Within each, there is a nearly infinite amount of variation possible. Listen to the similarities and differences in the verse-chorus structures of any two Beatles songs. Or compare "Happiness is a Warm Gun," one of the more abstract song forms in the Beatles' recordings, to the Beach Boys' "Good Vibrations"--both use a juxtaposition of contrasting sections, but that's about all they have in common. Nobody would argue with a songwriter who said he saw a creative opportunity in a particular form. Few would argue with Mozart or Brahms for choosing a sonata over a fantasia on any given day. But the choice of a more abstract form seems to raise hackles, precisely because the form isn't necessarily apparent to the listener. This even happens when fans of jazz or pop music try to engage with classical music for the first time--they think they need to be able to follow the intricacies of sonata form or fugue structure. They know just enough about it to know they are missing something, so they feel shut out from full appreciation. The more complex the form, the more likely we are to run into that kind of misunderstanding. And it is a misunderstanding. Form should command the listener's attention only when the composer wants it to. Let's say I'm writing a piece that has a prelude-type form--that is, one idea extended from the beginning to end. As a composer, I may choose to divide up that music into much smaller bits of varying lengths to make the composition process more manageable and the overall shape more balanced. I may need that outline, but it doesn't need to be apparent to the listener. Then again, maybe I want the listener to hear those divisions, or some of them. Then it's up to me to mark them in some way--a dramatic change of harmony, an accent, a contrast of rhythm or timbre or dynamics. The notion that something changes at that point should be apparent. If the listener isn't hearing what the composer intends, the composer hasn't done his job. Probably the most well-known example of this disconnect between formal design and the listening experience is Stravinsky's Symphony in C. This work was described by Stravinsky himself as a throwback to traditional form, "so unmysterious and so easy to hear on every level". But in 1962, Edward T. Cone's analysis of the first movement (from Musical Quarterly 48) found a detailed symmetrical map of phrase lengths that create syncopations against the constant unchanging time signature. This structure is highly remarkable because the work sounds, even to the most educated ears, like a perfect example of sonata form. But Cone's analysis revealed a hidden form that is arbitrarily sculpted to resemble sonata form: A wolf in sheep's clothing. This is one of the ways that Stravinsky always managed to sound like Stravinsky, regardless of the superficial details of style he chose to adopt. Would it matter to him that listeners typically don't hear the symmetrical march of integers guiding the phrase structure? No. The opposite in fact. As is evident from quote above, also from 1962, he intended the work to be heard in an open-faced sonata form; he could only have been magnificently pleased with the result. Some composers--notably Charles Wuorinen, who knew Stravinsky and was one of my teachers--have chosen to draw elaborate details of form directly into the score. I have twice lectured on this subject, the relation between the written score and abstract forms--once at Rutgers University Graduate Composers Forum and at Kendall Kennison's composition seminar at Goucher. The value of these more eccentric scores relative to the final musical experience is debatable on a case-by-case basis. But composers continue to find them necessary. As such, they handily show off the split between the creative process and the listening experience. Ultimately, when talking about abstract forms, it helps simply to be aware not only that the perceived form may be different from the composer's outline, but that the composer has already taken this into account. This was probably as true of Mozart as Messiaen. Likewise, tracking the creative process can reveal many interesting things about a piece, but it may not be necessary for the enjoyment of the piece. Most composers are aware of this--although too many times I have heard composers in pre-concert talks launch into a "how it was made" lecture that makes the music sound about as interesting as a slide rule. Performers, on the other hand, need to be constantly reminded: the score doesn't play itself. A successful interpretation depends on seeking out every detail you can find about the composer's intentions and then choosing how best to integrate those findings into a performance. The average crowd of listeners has it easier. They are the beneficiaries of all this work--if they don't get all of it, that's OK. As long as they know they don't have to. The music should speak for itself. I hope to record these more or less regularly. As I get a few minutes during the day, I'll sit down at the piano and just play whatever comes out. Usually I'm working over the same idea in two or three different sessions, sometimes more. But the idea itself is very, very basic--like here it's just some black key fourths and fifths in the left hand over a white key arpeggio in the right. That's the extent of precomposition. Then I just play and whatever happens, happens. This is from this morning. There's no rehearsal or multiple takes or editing or anything. I recorded directly to Facebook video using the camera on my laptop. So it's pretty raw. Love that. If you're interested in knowing more about me, you can friend me on Facebook. My CD Three Rooms (released November 2009) has been played on WPRB programs (The Worried Waltz hosted by Mr. Various aka composer Thomas Myernick and Clothesline hosted by Ui bassist and composer Wilbo Wright). It's also been reviewed by a colleague at the Asbury Park Press (unfortunately and completely mysteriously unavailable online) and by Rider colleague Christian Carey in his Sequitur21 blog File Under? . Both reviews were kind, but noncommittal. A couple other musician colleagues, Dane Scalise (Penny Nation, Invisible Movie Soundtrack) and Bill Milbrodt (Car Music Project), were more enthusiastic in their postings on the CDBaby.com page. Another friend, Tim Herbert, sent me his compliments recently, calling the CD "an interesting minimalist endeavor". Tim was a bandmate of mine when we were both teenagers in Pittsburgh. Trust me, "an interesting minimalist endeavor" is high praise. But this morning, I got an email from him telling me I sounded like songwriting legend Jimmy Webb in his solo recordings. Webb was never a big influence on me, but I have to admit I'm pleased with the comparison. "Don't get a big head, now," Tim said. Like most songwriters, it is hard for me to understand what people hear when they listen to my music, so I'm looking for any sign of trends among the responses. It seems the people that are most excited about this CD are those who have some recording or songwriting background, or both. Some friends who are nonmusicians--who have praised some of my older music--are indifferent to this CD. And almost everyone who has liked it has said they have to listen to it more than once. Some of them have listened to it many times. So I gather that somehow, in its simplicity, Three Rooms is still something of a challenge for listeners. That's a good sign. I was aiming in this CD to bring my classical and experimental music background together with my lifelong hobby of songwriting. I wanted the music to have some depth, some extra layers of interest, and still have a transparent, intimate feel. So I'm left sort of back where I started, reaffirming the need to be true to my own instincts. And hoping that, for whatever reason, people will look for meaning in my work. If I'm honest in what I do they stand a better chance of finding it. One of the things I didn't get to mention in my review of the Varese concerts at Lincoln Center is the use of two Theremin cellos in "Ecuatorial" (based on texts from the Mayan book of the dead). These appear to be of Floyd Engels' manufacture. 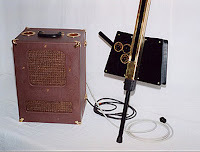 Engels builds recreations of the original Leon Theremin-built instruments. Theremin designed the instrument to Varese's specifications, specifically for this piece. He built a number of these instruments but all but two were lost or destroyed. The two remaining were broken for years, leaving Engels had to "reverse engineer" the instruments to reconstruct them. 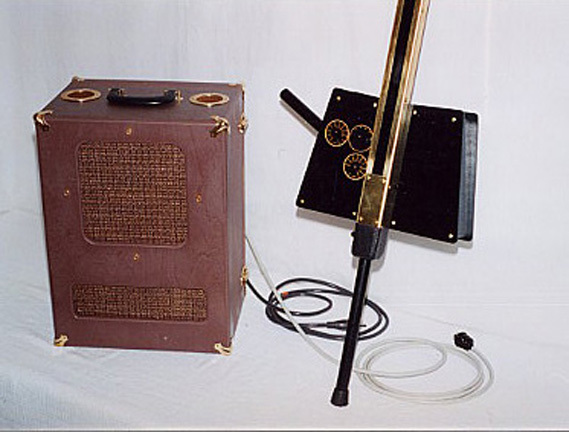 The Engels instruments were debuted in a performance of "Ecuatorial" at June in Buffalo in October of 2002. Basically, the instrument is a Theremin triggered from a contact strip along a fretboard rather than from an antenna. The left hand fingers pitches like a cellist stopping the strings. The right hand (the bow hand for a cellist) controls a volume lever. As you can see from the photo, the Theremin cello look like "Warehouse 13" artifact--a rockin' retro chic in black and bronze and knobs, complete with its own fabric-and-screen-covered amplifier/speaker box. For Varese's piece, each one sounded like a straight-up Theremin--kind of crappy, in other words, but entirely appropriate to the music. Obviously, being an electronic instrument, it would be appropriate to filter the sound through any kind of effects, giving the instrument a flexibility similar to an electric guitar. That is harder to do than it appears however because the Theremin cello's sound-producing mechanism is wired into its amplifier/speaker box. The instrument itself sends a signal but doesn't produce any sound. Even without this limitation, most Theremin players I've heard stick close to the original sound (think the sound used in the Beach Boys "Good Vibrations," although I think that was a related instrument, not a true Theremin). Why, I'm not sure. I think they think it's beautiful. Some days I think they're right. Common wisdom is that Theremin is an instrument who's time has come and gone and that now it is mainly a historical instrument. But there a lot of Theremin players out there that would disagree with that, who see it as a vital, evolving instrument with a growing repertoire. Hopefully the exposure at Lincoln Center will spark a renewed interest Theremin's inventions and some new music for them. Meantime, there's a wonderful (and sad) documentary on Leon Theremin that I can recommend to everyone, called "Theremin: An Electronic Odyssey", (1994, directed by Steven M. Martin). Great film. Last night, heading out of Lincoln Center in search of a bite to eat, my daughter and I were struck by a wild music bouncing around in the air outside Alice Tully Hall. Got up closer to the corner and we saw him: a gentleman of about my age (50-something) in graying dreadlocks, playing the hell out of a glockenspiel. It was something out of the weird world of free jazz, a kind of pseudo-major-scale bebop, with stuttering rhythms like the uneven stop and start and shuffling feet and murmur of the small crowd flowing around him. It sounded like a tribute to Varese, like a flower on his tomb. We had just come out of the "Varese: (R)evolution" concert at Avery Fisher and Varese posters were draped all over the place at Lincoln Center, particularly at Alice Tully, where Part One of the Varese concerts had been the night before. With that exquisitely monstrous music still in our heads--huge full orchestra, a dozen percussionists--here comes this street performer, testifying to the same powerful vision of beauty one note at a time. Maybe he had been there too, at the concert. Or maybe he just knew--his hand on a lever of truth. The way I knew before I ever walked into the concert hall (where I had it all, all my faith reaffirmed). The way hopefully my daughter will know now for the rest of her life. And he wanted to share it. Reminded me of the old days, before New York became a shopping mall. Something found on the street, letting the tinkling craziness wash over us and the whole city and the hot night. Oddly beautiful moments that come with no packaging, no explanation, no currency equivalent, and that you know you'll remember for the rest of your life. Going tonight and tomorrow to hear the Varese (R)evolution pair of concerts at Lincoln Center, reviewing them together (I hope for the Asbury Park Press, although whether they'll be able to run it remains to be seen). There was a nice tribute piece on Varese in the New York Times, singling out Ionisation as one of his most significant works. Part 1 of the event, tonight, is at Alice Tully Hall featuring the International Contemporary Ensemble and So Percussion. Part 2 tomorrow night features the New York Philharmonic at Avery Fisher Hall. I'm in love with the modernism of the era that Varese represents, the 1920s in the U.S. There was an incredible inventiveness and richness to the ideas that were circulating in the "dissonant" school, including the work of Charles and Ruth Crawford Seeger, Dane Rudhyar, George Antheil, Henry Cowell and many others. Inspired by the groundbreaking work of Stravinsky and the improvisatory style of Leo Ornstein, this stuff had little or nothing to do with Schoenberg's 12-tone technique that later overwhelmed the cultural notion of atonality and the use of dissonance. 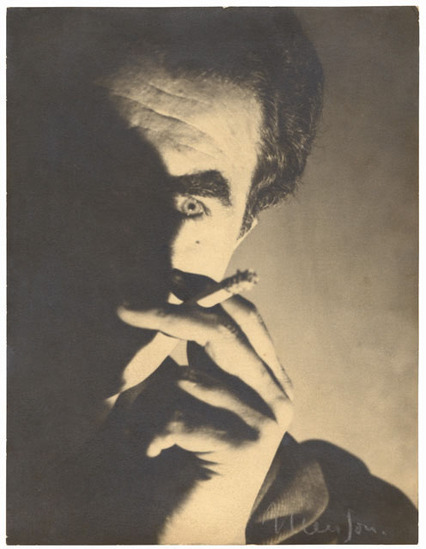 Varese was a spiritual leader of this movement, refusing to compromise his aesthetic even when the conservativism fostered by the Great Depression eliminated the opportunity for performances. As a side note, it is striking to me how American Varese is. An immigrant and an iconoclast, he inspired a generation of composers all over the world, but American composers in particular. Frank Zappa is among the most notable, corresponding with Varese about the time the older composer was writing Deserts. Zappa was himself an iconoclast and a loner, like Varese. And he was also the son of immigrant parents and strongly aware of that fact. That notion of displacement expressed through dissonance and experimentation, and of a unity, a translatability between the cultures of the world, has something to do with the styles that emerged in American life in the 20th Century. It fits in with psychological and cultural displacement found in the music of Charles Ives, considered the founder of whatever an American style is. But I'm rambling now. More on all that some other time, I suppose. I have work to do if I'm going to make the train to New York later. I'm excited to be going to the Opera New Jersey performance of Don Giovanni tomorrow afternoon with my daughter. Andrew Garland, pictured in the photo at left, will be playing the title role. I'll be the gray longhair with the pouting teenager on my arm. But, come to think of it, in a town like Princeton, that may not be enough information to single me out. The opera is one of Mozart's finest, of the trio of collaborations with librettist Lorenzo Da Ponte that also includes "Le Nozze di Figaro" and "Cosi fan tutti". These are all mature Mozart, setting stories told cleverly and often brilliantly by Da Ponte. "Don Giovanni" is the Don Juan legend, the story of a libertine nobleman who seduces scores of women and finally meets his fate at the hands of a murdered father's graveyard statue. But he is still remembered first and foremost as Mozart's librettist. He liked the notoriety and played it up, even crediting himself with discovering Mozart and introducing the composer to the world's audiences. "I can never remember without exultation and complacency," he once wrote, "that it was to my perseverance and firmness alone that Europe and the world in great part owe the exquisite vocal compositions of the admirable genius." Well, they are three really terrific operas, that much is certainly true. Mozart had written well over a dozen others before his collaborations with Da Ponte and none of them really captured the public's imagination in the same way. So I'm excited to be going to see what promises to be a good production. Showtime is 2 p.m. at Princeton's McCarter Theatre, main stage. Heading out this morning to a meeting with the Rider Sustainability Across Curriculum group at the Lawrenceville campus. Last fall I started teaching a Freshman Seminar at The College of New Jersey then titled Music and Environment (now Music and the Natural World). The idea was to increase sensitivity to environmental concerns by showing the intricate relationship of this aspect of human culture to our natural surroundings. The idea for the course came out directly out of a discussion on sustainability and music theory curriculum on a Society of Music Theory list. The very beginnings of this discussion on SMT raised the hackles of many theorists and I certainly don't blame them. As all music majors know, music theory courses are routinely jammed with information. They are notorious for shoe-horning in every possible technique of historical Western music theory plus a handful of ethnomusicological bric-a-brac. On top of that they also usually entail some ear-training, sight-singing and often a piano keyboard mechanics component. While they may have become more condensed, music theory has been taught more or less the same way for hundreds of years. So the very thought that you could rejigger the music theory curriculum to fit into an all-of-a-sudden academic trend like sustainability just seemed a bit outrageous. Further, the topic itself seems pretty removed from any direct connection with sustainability--what is there to be sustained in music? How does music theory affect the physical environment and how can recycling or solar energy improve it? I point all this out because the discussion actually did become useful, once we began to brainstorm and talk about intersections of environmentalism and music that interested us. And the course, so far, has turned out to be one of the most exciting that I've taught. The multimedia performance Meghaduta is this Sunday, June 27 in Nicholas Music Center. Nimbus Dance Works is July 7 in the New Theater. Both venues are located in the Mason Gross complex at 85 George St., New Brunswick. For more information visit the series website: www.masongross.rutgers.edu/music/summerseries/html. The Axelrod Performing Arts Center is hosting special Songwriters by the Sea 8 p.m. this Sunday. Jersey Shore stars Joe D’Urso (Stone Caravan) and Joe Rapolla (the Perfect Square) are hosts with a line-up of songwriters who have had hits of one sort or another. They will join the two Joes onstage to perform and talk about their work and their stories from decades in the music business. As a special treat, Grammy-nominated virtuoso guitarist, Gary Lucas (Gods and Monsters) will be a featured guest. Lucas was recently named one of the top 100 greatest living guitarists by Classic Rock Magazine. As a solo artist he sells out concerts all over the world and has been called "the world's most popular avant-rock guitarist" by Britain's the Independent. "Grace," a major hit for late Gods and Monsters bandmate Jeff Buckley, was co-authored by Lucas. Le first came to public notice playing with the legendary Captain Beefheart (Don van Vliet) and he currently performs with Fast 'N Bulbous, a free-jazz band performing many Beefheart originals. Lucas is also a film score composer and will be performing live excerpts from his soundtrack to the silent film "The Golem" at Axelrod on June 27, as part of the Jersey Shore Film Festival. Other songwriters performing at Songwriters by the Sea will be Willie Nile, Dean Friedman, Mike Black and Linda Chorney. While this annual event attracts many of the same faces each year, some of the participants will be taking the stage for the first time. Tickets are $20 available through the Axelrod box office or by phone at 732-531-9106. Information on "The Golem" performance listed in this blog post was corrected 11:44 a.m., about 1 1/2 hours after initially posting. What's missing in discussions on the subject of immigration is a tone of compassion. These are our neighbors and, as Arizona is only now discovering, an important part of our workforce and an important part of our lives. You would think we feel an obligation to do a little more than simply say, "Hey, what the hell are you doing here?" These are neighbors that have left their families and risked their lives to come to the U.S. Millions of them. They aren't coming here for the view. They're not here on vacation. They're not here on a whim. They often had to go through hell to get here and they were willing only because it is the course of last resort. During the final waves of immigration from Europe, most of us were people of relatively modest means. Our children's favorite toys were marbles and cloth dolls that cost pennies to manufacture and purchase. The immigrants then worked hard for low wages and built themselves up, generation on generation. Now, one of the biggest arguments I hear about illegal Latino immigrants is how much they are costing us. Don't we have that to spare? Shouldn't we feel an obligation to make it easier for them to build themselves up, generation on generation? Shouldn't we appreciate their hard work? Yes, thousands more low-income people mean a strain on public schools and hospitals and maybe we'll have to pay more in property taxes as a result. Shouldn't we do that? Do our children really need new cell phones and computers and iPods and Wii's and Playstations and whatever the hell else? Are we so protective of our treasure that we have to build an impenetrable wall to guard it against our neighbors? At that point, do we have a functioning community anymore? The arguments in favor of trying to wall off Mexico somehow, trying to prevent any of those folks from coming in illegally--those arguments have a nationalist fervor. America for Americans. But what it boils down to is simple frustration and greed. Greed for obvious reasons. Frustration because, in Arizona, illegal immigrants account for a large part of out-of-control organized crime. And yes, that can be tied directly to U.S. immigration policy. Toughening the policy might help in the short term--then again, it might not. The U.S. shares thousands of miles of land border with Mexico. A shared coastline on two shores makes the problem of patrolling that border even tougher. What will help in the long term is making sure that Mexico and the southern U.S. achieve parity in the standard of living. We have a long way to go on that score. We're filthy rich and they're dirt poor. We have opportunity for everyone. They have opportunity for only a meager few. Once a greater parity has been achieved, all this will fade into memory. Like a bad dream. How do we do that? Well, I suppose it would have to begin with a close look at why NAFTA failed to help Mexico. And then build from there. In addition to the choral concert this Saturday I mentioned here yesterday, a rival for your attentions may be the Canticum Novum and the Russian Chamber Chorus of New York performing Alfred Schnittke's Concerto for Choir in a joint concert at 8 p.m. at St. Ignatius of Antioch Episcopal Church, 552 West End Ave. at 87th St., New York City. Harold Rosenbaum, director of Canticum Novum, will conduct this performance. On Sunday at 3 p.m., Nikolai Kachanov, director of the RCCNY, will conduct the same work with the same ensemble at Madison Avenue Presbyterian Church, 921 Madison Avenue at 73rd St., New York City. The program for both will also include Arvo Part, Nikolai Golovanov, Yuri Yukachev and others. Tickets are $15 for students and seniors and $20 for the rest of us. Call 212-279-4200 or visit www.rccny.org or www.canticumnovum.org for tickets and more information. Mark Shapiro and Cantori New York present a concert accompanied by an ensemble of eight cellos 8 p.m. Saturday, May 15 at the Church of the Holy Trinity, 316 East 88th St., New York. 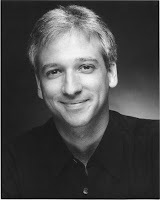 Shore-area concert-goers know Dr. Shapiro from his work with the Monmouth Civic Chorus. I have written about and praised the MCC many times but I have yet to make it to a Cantori New York program. It doesn't look like I'll make it to this one either, but the program itself sounds terrific and I wish I could be there. It's refreshing and tantalizing to see an ensemble of eight cellos touted in a press release that does not include mention of the "Bachianas Brasilieras No. 1" of Villa Lobos. Instead, we have a program entirely of new works by Arvo Pärt, Piotr Moss, Ivan Moody, Erol Gurol and Nicolas Bacri. Vocal soloists will mezzo-soprano Rachel Calloway and soprano Ariadne Greif. Buy tickets to the concert through the group's website or call 212-439-4758 for more information. An editorial in the Asbury Park Press from May 1 sparked a lively retort from a member of the Monmouth Civic Chorus, printed in the paper the following week as a guest editorial. The writer of the response, Jenni Blumenthal, was ticked that in extolling the virtues of live music in New Jersey the editorial didn't mention any of the local classical groups. It didn't mention classical music at all in fact, local or otherwise. I suppose as a classical music fan, I should be offended by that. But the fact is, I'm used to it. The Monmouth/Ocean media and general population overlook classical music. It's very difficult to generate an audience for it, even if you're a world-class outfit like the New Jersey Symphony Orchestra or the Opera New Jersey. That's why theaters in Monmouth County aren't even on the radar for groups like Opera New Jersey. That's why the 50-summer run of the Metro Lyric Opera could halt without any public outcry and without attempt to replace it. That's why NJSO now limits its performances here to an educational "Best Of ..." series of one-hour concerts--the NJSO is bending over backward to cultivate an audience because the culture for appreciating classical music just doesn't exist here. When the media talk about live music, they are generally talking about longtime pop radio celebrities of one stripe or another, names that can fill thousands of seats at a shot. But that's just not who we are musically, nor is it who we want to be. I don't expect everyone to be a classical music and jazz fan. But most of the live music that happens here is in yet another category: hundreds of small local bands that are touring and may exist as a performing unit only for a year or two. But even that rich, vital culture of bands and clubs that host them gets barely a whipser of mention in this APP editorial. Instead the writer mentions only the big theaters and arenas and the acts that can fill them. The most commericial kind of musical experience. While some current pop stars, like Lady Gaga, make the list, most of the names mentioned by the APP writer are stars in their 60s and 70s who've turned gray playing their hits of 30 years ago. Classical and jazz traditions exist to continually reinvent the past, but pop rock does not. It exists in the moment and then quickly fades into memory. As a group, what these artists have to offer is notalgia for a time when their music was relevant. There's nothing wrong with that. But if we're trumpeting the musical vitality of New Jersey, citing the living dead as an example is hardly the way to go about it. Below is a forwarded press release. The notion of "microtonal" music emerged as a response to the standardization of chromaticism in Renaissance Europe. Our musical tradition since that time has been based on the notion of 12 pitches within the octave, derived and defended by theorists using a cycle of intervals of a fifth (produced by the proportion 3:2). Vicentino was one of the earliest historical figures pointing out that there is nothing particularly "natural" or superior in such a limitation. He argued for an adjustment to the system to add in other possible divisions of the octave discussed by ancient Greek theorists, particularly the strange-sounding "enharmonic genus". 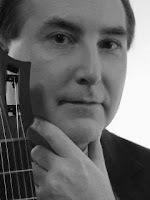 Johnny Reinhard, also on this program, is one of today's leading proponents of microtonal music and is founder of the American Festival of Microtonal Music. I would love to be able to check out this recital, but I won't be able to make it. 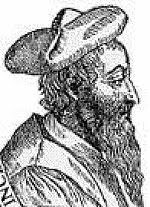 Nicolo Vicentino (1511-1576) was a priest, composer, and music theorist who claimed that with proper support and encouragement he might revive the fabled secrets of ancient Greek music. Written for an a cappella vocal quartet, the piece was composed in the enharmonic genus, a secular Latin motet that sets a prose text in honor of Vicentino’s patron, Cardinal Ippolito d’Este (for whom Palestrina worked as well). Also on the program are works by Ge Ganru, Rami Seo, Sasha Bogdanowitsch, and Johhny Reinhard. The concert debuts the Terpstra synthesizer, along with amplified cello scordatura, Korean Gayageums, and a multitude of homemade instruments. Facta rua, Hyppolite, excelsium super aethera mittat. Your great deeds, Hyppolitus, she might send high above the heavens. The second half of my Asbury Park Press column this week touches on the political stand against teachers taken by the state and by voters in certain districts. Three paragraphs of this discussion got edited out of the print version, purely for reasons of space. But the entirety appears on the website (click to the second page of the article, with the subtitle "In Praise of Teachers"). I strongly urge those of you interested to read it there. According my freelance contract, I don't own those articles and am forbidden from reprinting them, so you'll have to go there. Undoubtedly though, I will restate those views here at some point, as I just can't seem to keep my mouth shut. The Monmouth Civic Chorus twice performs a program called American Folk in Middletown. Metropolitan Opera stage director Eric Einhorn will help direct the semi-staged concert, with conductor Mark Shapiro leading the ensemble. The group will blend full-choir arrangements of folk tunes with members' memories of music from important moments in their lives. The first performance is 7:30 p.m. Saturday, May 1 and the second is 4 p.m. Sunday, May 2. Both are at the Middletown Arts Center, 36 Church St., Middletown. Tickets are available at the door, costing $25 for adults, $22 for seniors and $5 for students. For more information call 732-933-9333 or visit the group's website. 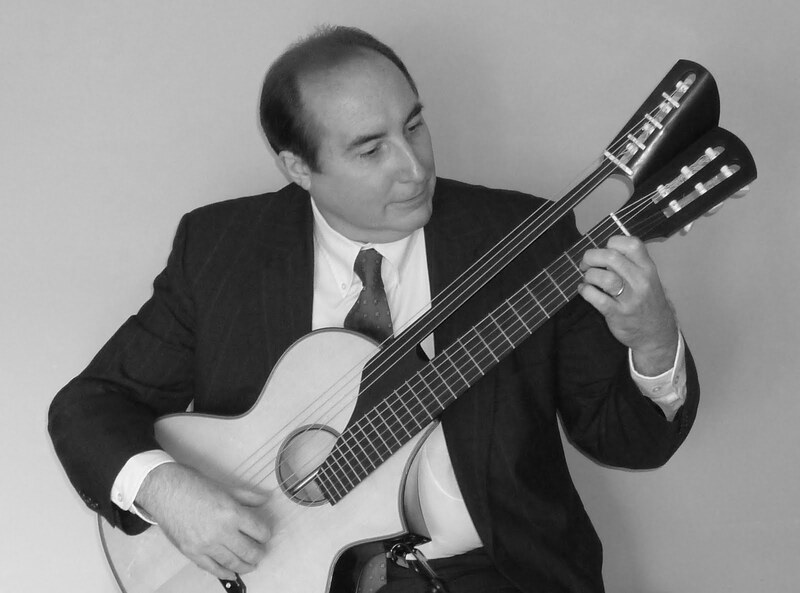 Guitarist Stanley Alexandrowicz, a friend of mine from way back, is playing a solo recital 4 p.m. this Sunday at Historic Christ's Church, 2 Paterson St., New Brunswick. The recital is part of the church's Evensong presentations. Of course, the unknown is always more interesting until it becomes known. But in Stanley's case, I think we're guaranteed that the music will be interesting on its merits and not merely as curiosity. Like all Evensong concerts at Christ's Church, this is free. For more information, phone 732-545-6262 or visit http://www.christchurchnewbrunswick.org. Tonight I'm going to The College of New Jersey Percussion Ensemble recital, 8 p.m. in the Music Building theater. Free admission. This student ensemble is led by Bill Trigg, who appears with area orchestras and ensembles including the Car Music Project. In addition to being the director of the percussion ensemble, Bill is the main percussion instructor at the college and the coordinator of the schools percussion resources. A bunch of new music will be on the program. Bill himself has written something for this concert along with me and others (whose names I don't know yet). According to his Facebook announcement "6 works written within the past 20 years, 6 living composers, 4 in attendance! Gonna be awesome!!" Bill will be on WTSR, 91.3 FM, from noon to 1 p.m. today talking about the program. The piece of mine is a very short quartet for mallet instruments that I wrote as a part of a handful of composition studies using the computer. The title is 'L'Homme Arme' Canon and as that suggests, it was inspired in part by the centuries old pop song, "L'Homme Arme" ("The Armed Man"). The old song has been famous seemingly forever, although these days it is most famous for being famous. During the Renaissance, it was one of those songs that everyone knew, apparently, even non-French speakers. As a consequence composers liked to play with it, quoting it in various works. In particular, the song appears as a basis for dozens of masses during the 15th, 16th and 17th centuries. Why I was playing with it I'm not quite sure. I liked the way the structure of the melody defined the structure of mass movements by those composers, so I was adapting it into a modern idiom and finding that it still worked quite well. I also liked the testosterone-laced implication of the lyric--the armed man is coming, protect yourselves! It's a message that wouldn't look out of place in a rap song. One of the pieces that came out of those studies was "Les Femmes Armees" ("The Armed Women"), a solo flute toccata that Elizabeth McNutt and Patti Monson have both performed. The tune doesn't appear in there anywhere, but it is affecting the background structure and, more importantly, the music developed directly out of my playing with the "L'Homme Arme" tune. The "Canon" on tonight's program is a tricky little number and the tune is spelled out a couple times, most notably by a piano playing in octaves at the end. (One of the two vibes players gets to play the handful of piano notes.) This piece started off, like most of my music, as an atonal piece. But as I was writing it I get stripping out accidentals and smoothing out the voice-leading. Little by little. Finally, I threw up my hands and said, OK, it wants to be in F Major, let it be in F Major! From there I finished it in a couple hours. The piece then sat on the shelf for 14 years--partly because it was so short, partly because it was a bit of an anomaly in my style and partly because the low marimba part goes all the way down to low F, which most instruments can't do. So I let it sit there until Bill happened to mention the low-range extension on his instrument and invited me to have the Percussion ensemble perform something of mine. I attended a rehearsal Wednesday and they are is doing a great job with it. But man is it short! Don't hiccup or you'll miss it. NOTE: I'm removing this post from my archives in February. For some reason (that appears to have nothing to do with this blog) it has been attracting a steady drumbeat of robo page views and its skewing my stats. Rutgers University's Nicholas Music Center will host regular piano forums featuring distinguished guest artists in recital and master classes. The hall sports a new Steinway and is eager to start showing it off. I don't know yet how often the forums will happen and the info isn't yet posted on the Nicholas website. When I know more, I'll update. The first installment will be 5 p.m. Tuesday, March 30. Pianist Jerome Lowenthal, will perform and give a masterclass. Lowenthal is a living piece of piano history having been coached by Artur Rubinstein and appearing with the world's great conductors, including, among the living, Barenboim, Ozawa, Tilson Thomas, Temirkanov, and Slatkin, and, among those relegated to history books and vinyl recordings, Bernstein, Ormandy, Monteux and Stokowski. Lowenthal is a teacher at Juilliard and is planning a recording this year of the complete book of Liszt's "Annes de pelerinage." Lowenthal will give an hourlong recital of work by Liszt followed by a two-hour master class with Mason Gross pianists. A great opportunity to see and hear some of the best of the great piano tradition as it is transmitted from one generation to the next. Admission is free and everyone is welcome. Also, according to the press release: "PIZZA will be provided between the recital and the master class, for all those who attend." That's their capitalization. The only other words in all caps are "JEROME LOWENTHAL" at the start of his bio. Don't underestimate pizza as a marketing tool. Nicholas Music Center is located 85 George St., New Brunswick on Rutgers Douglass campus.